Big Agnes Woodchuck Camp Table. 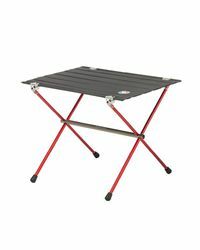 The ultimate upgrade to any outdoor scene is a convenient hardtop table that is easily packed in and quick to assemble. The Woodchuck Camp Table, at a blink over 2lbs., sits 17" off the ground, which makes it the perfect companion to your lightweight camp chairs. Making meals in the backcountry is a snap when you have a solid surface for prep and eating. Also makes a great sturdy spot for setting down drinks, organizing gear, or giving the kids a spot to sit at during backyard BBQs. Length x Width: 21.5 x 15.5"